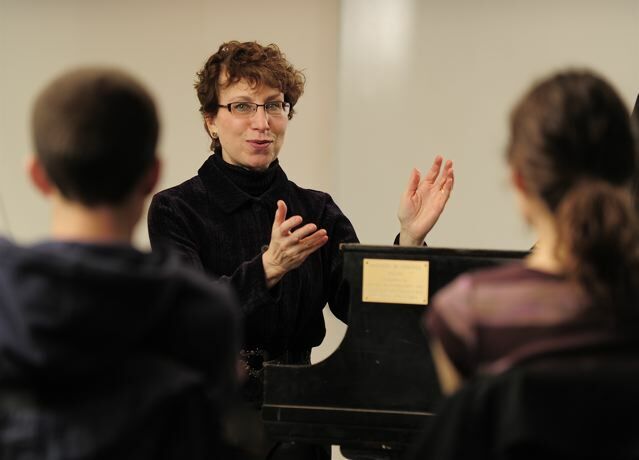 Based on her original observations concerning the perception of musical pitch, interval, and rhythm, Professor Marianne Ploger has created and developed a comprehensive musicianship program oriented toward real-time music cognition. Her method is currently the basis for the musicianship curriculum at The Blair School of Music at Vanderbilt University in Nashville, Tennessee; Professor Ploger also offers Musicianship Intensive courses and frequently presents her discoveries and theories in workshops and lectures around the country. This website offers resources for students and teachers and a platform for the development of a community interested in heightening our musical powers of communication by deepening our understanding of perceptual principles. Learn about how The Ploger Method® has been adapted as the foundation for classroom curricula. You can also visit the feature pages on Musicianship programs at The Blair School of Music at Vanderbilt University and The University of Wisconsin - Stevens Point to learn more about how these universities have collaborated with Marianne Ploger to incorporate her novel approach into core curricula. With the correct information and proper attitudes, all musicians can learn to know, recognize, and understand what they are hearing in music, at the same speed that they know, recognize, and understand what they hear and read in their native language. Click below for free articles and featured content related to musicianship training and issues of music perception and cognition. Each summer, Marianne Ploger offers intensive, week-long workshops at three levels. The classes are aimed at bolstering fluency in music and focus on musical comprehension in real-time; the intensives also involve discussions of perception and cognition with the aim of developing heightened awareness of our learning processes.